Important Basic Financial Terms Every Newbie must know! We have been discussing numerous financial topics through a variety of insightful articles on this platform. This time we thought of taking you back to the very basics of finance. 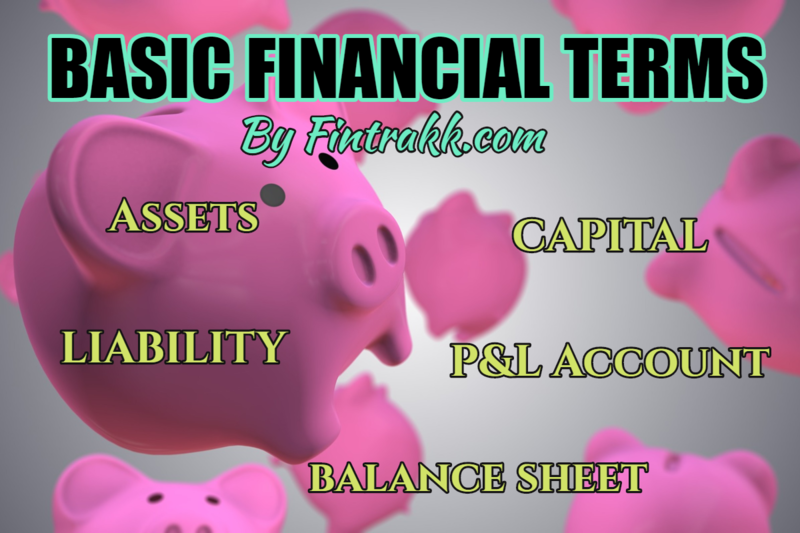 As a newbie, you will get an answer to: What are the important basic financial terms or accounting concepts that you must know? A set of common accounting definitions that shall help you gain financial literacy even if you are not in the said field. A short glimpse of Investing in shares or stocks is also given. In order to become savvy about your own finances, you need to understand few useful financial terminologies. So, here is a comprehensive list of various financial words or concepts that you are likely to come across in your financial expedition. Now, whether you are a salaried person, a startup enthusiast or a common man, these set of financial basics shall help you manage your money a better way. We have tried to explain these basic financial terms from a personal viewpoint as well as clarified their significance in business. Asset is an economic resource, something valuable that you own as an individual or a business entity. In simple words, something that adds money value, it might be in the form of a tangible(physical) or intangible(not seen or touched) asset. e.g. The house and the car you own are your personal assets. As a business owner, the land & building, the furniture, machinery, laptops, cash etc. that you have are your tangible business assets. The goodwill, patents, trademark etc. are few intangible assets of any business or company. The assets that you own basically count towards your net worth. They can be easily sold to generate money in case need arises in future. Business assets are a crucial part of a Company’s Balance Sheet. Liability simply refers to what you owe to somebody. In the race of starting or growing your business, you tend to create debts or bank loans etc. The same needs to be paid back along with interest as applicable. The liabilities can be short term or current liabilities(to be met immediately or after a short while) like creditor’s dues or long term like term loans(that are spread over a particular tenure). These short term or long term debts that you need to repay back add to your liabilities. e.g. Your credit card bill or EMI for your home loan is your personal liability that you have to bear every month. Similarly, the secured loans or unsecured loans taken on behalf of your firm or company count towards your business liabilities. Financial statements are a great tool for business owners, investors and individuals to learn and review the past and prevailing financial condition of any firm or company. Think it like a quick snapshot that shall help you know about the financial situation of any company. As the name itself suggests, this financial statement summarises the profitability situation of an entity. Profit & Loss Account or P&L Account displays the income earned and related expenses incurred during a particular period. The net of income and expenses amounts to the profit/loss of a business during a set time period. Generally a quarterly or annual P&L statement is analysed. If you wish to check whether a company is actually profitable, then P&L shall help you get the requisite answer. A summary of the financial position of the company on a specific point of time. Assets, liabilities and owner’s equity are an indispensable part of a balance sheet. “What a Company owns” i.e. its Total assets and ” What a company owes” i.e. its current as well as long term liabilities plus the share capital form an important component of this financial statement. Capital is an essential pre-requisite that is required to run any business or company. The partners or directors can introduce initial capital. But, looking at the growing needs of any business, you may require additional funds or money to be invested by outside parties to further manage your business. May it be working capital needs i.e. the funds needed for routine activities of any business organisation or various other business demands, Capital plays a pivotal role. So, whether you wish to start a company, procure goods, purchase business assets, pay wages or salaries to staff, incur other business expenses etc. you require money for that. When a business requires funds to expand and grow, this can be done in 2 ways through: Equity or Debt. A company can acquire funds through “Equity” i.e. by giving ownership of its shares. We call this as Share Capital that refers to the sum raised by a Company by issuing its shares. ALSO READ Fintrakk : 1 Year Blogging Anniversary! Let's celebrate! The second way is by applying for loans from banking or Non Banking Financial Corporations(NBFC). This component is known as “Debt”. A statement that depicts the money that has entered your business plus the money that exited during a specific period of time. How much cash/money has been generated? How much of money has been actually used in various business activities? These queries can be answered looking at this financial statement. Hence, in Financial accounting, Cash flow statement comprises of cash generated and used in operating activities, investing activities and financing activities. To summarise, the Cash flow statement helps to know the cash inflow and cash outflow and reconcile the cash position of a company. This statement proves quite handy for investors. Compound interest is a really powerful concept that every newbie must know in order to learn to multiply his earnings in the long run. The magical power of compounding refers to generating returns on your principal amount plus on the returns already earned. Confused…Let’s be more clear! When you earn interest on your amount invested as principal plus on the interest earned amount also, your returns are going to compound or grow at a geometric rate over the years. This concept plays a crucial role in your retirement planning. The earlier you start planning your savings and investment, the better accumulated funds you shall have on your retirement. We told you above What is Share Capital from the Company’s point of view. We generally hear about investing in shares or stocks. But, as a newbie investor, you might wish to know what this actually means. So, from an individual point of view when we hear Investing in shares this refers to shares of a company. A share of ownership that you shall get in a company whether private limited or public limited company. To simplify, we can say, as an investor, when you buy shares of a company, you become its shareholder. Now, if that company performs well and its share price rises, the investment that you had made in it shall automatically increase. In layman terms, you shall earn profits. But, if due to some internal or external factors, the company performs badly and share price of a company falls, your returns reduce. You shall bear losses. Share market is highly volatile and huge risk is involved in share trading and investing. So, be cautious and act wisely while investing your hard earned money. If you are willing to enter the financial arena in any way, you must understand these basic financial terms. But, even if not, these interesting concepts can help you in one way or the other. So, whether you are a student of commerce or wish to build a career in the finance field, your learning base must be strong. And, whenever you prepare for an accounting job interview or a good role in the financial sector, don’t forget to revise these simple yet crucial basics. Moreover, you’ll become an individual investor sooner or later. So, if you can gather any kind helpful financial information, you’ll surely gain a lot from it. Finance is a wide arena and it’s not possible to cover all the concepts in a single article. We shall try to cover some additional financial terms in our upcoming posts. For a better understanding and knowledge, we have discussed few common financial terms that you shall encounter somewhere in your personal or business life. Now, that you know a bit about these common basic financial terms, you can better analyse different financial data. Did we miss to mention any popular financial concept here? Do you have a query regarding any financial terminology or accounting term? If yes, feel free to ask us in the comment section. We shall try to explain the same in an easy manner. « Flexi Business Loans: A Smart way to Manage Your Business!